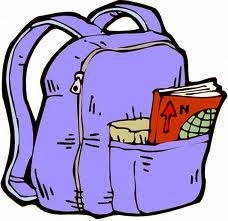 Getting to Know Your Characters: What's in the backpack? One of my favorite getting-to-know-your-character exercises to do with young students involves a familiar object: the school backpack. We writers talk a lot about getting to know our characters, which, to those who DON’T spend entire days with imaginary people, might sound a bit odd. Frankly … it is odd. Really odd. Because the whole exercise implies there’s an otherness to a character, an existence outside ourselves, when in fact these folks are inventions of our own design. We control them, right? In reality, getting to know a character is really about exploring your own imagination, digging deep or opening closed doors to discover what you really want to write about. So these exercises are about springing locks. Getting us to see things/people/situations in new ways. For me, making lists doesn’t help much. Lists lock me into traditional ways of seeing. Asking my character, “What’s your favorite color? Your favorite food? The name of your dog?” relegates my character to a world strikingly like the one I live in. And fiction is where we don’t live. It’s an edgier, riskier place. That’s why we like it. So I like to pry, into shadowy places where my characters don’t expect me to go. That’s when I learn who they really are … and that’s when surprising things, a.k.a. plot … happen. The other day, I made serious headway on my latest novel when my character pulled out his coat from last season and I stuck my hands in his pockets. You know what I’m talking about: last fall’s jacket, it wasn’t sent to the cleaners, and … there’s stuff in the pockets. Old, forgotten stuff. For my character, it was ticket stubs and a mini tin of Altoids. If coat pockets don’t work for you, try peeking into your character’s bathroom drawers. Medicine cabinet. Fridge. Glove compartment. Go through her purse. Get hold of her phone and read her text messages. Sound creepy and invasive? Trust me: it yields pure gold. This is very, very fun to do with adolescents and teens, who like anything remotely naughty. And peeking into someone’s backpack is all of that. Here’s the how to: get hold of a couple of backpacks. Into each, throw about seven items. This is actually harder than it sounds … you don’t want to be too “leading,” or too banal. The combinations of items usually yield a good harvest. For example, in one of my recent packs, I put both a detention letter AND a National Honor Society pin. The day before I had omitted the pin, and the results were far less interesting. So give students some tensions to work with. I also like to create one pack that screams gender specificity. The kids often assume the character with the headlamp and the knot tying guide is a boy who likes the outdoors, and they ALWAYS assume that the character whose backpack contains cuticle cream, nail polish and hand sanitizer is a girl. After we’re done talking about “her,” I ask them to tell me about the character if we assume it’s a boy carrying the cuticle cream,. That’s when the fun begins … and when the story lines start to emerge. He’s either a thief, or a boy with secrets, or a boy with unrequited love, or a flake who picked up the wrong pack … the kids start spinning tales. If you have a very limited amount of time, snooping through the packs and discussing, as a group, who these characters might be, is all you can accomplish. That’s okay: the snooping exercise is truly “news they can use,” a technique not only for jump starting new stories, but also for fleshing out characters in stories-in-progress. For example, the revision stage is a great time to dig a little deeper into a character’s life. The better we know them, the more consistent they will be! On days when I have lots of time with students, we take what we learned from the backpacks and move on to the “Plot Follows Character” prompt. But … that’s for another post! In the meantime, teacher and middle grade author Kate Messner had a great National Novel Writing Month post with lots of ideas for kids who want to get to know their characters. Take a look here … and happy writing!